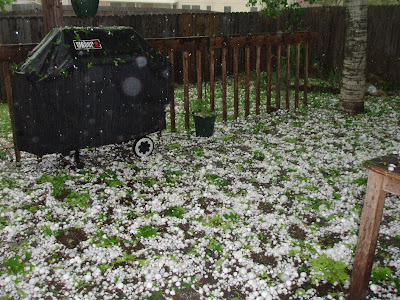 When we moved to Austin, Bob and I were warned about the hail. We saw cars with their tops dimpled like golf balls. Hail, we were told. Hail is apparently mostly very local, and today it was local to us. It cracked the outer pane of the skylight in our kitchen and took out all but two of my fledgling tomato plants. I have been running out every day to gaze at my tomato plants, growing well with their neat row of stakes and I am more saddened by the lose of them than I am by the damage to the skylight. Although I am sure that repairing the skylight will be much more problematic than replanting tomato plants. Our neighbors on the corner lost the back window of one of their cars. A car full of water and hailstones sounds more disheartening then my tomato plants.